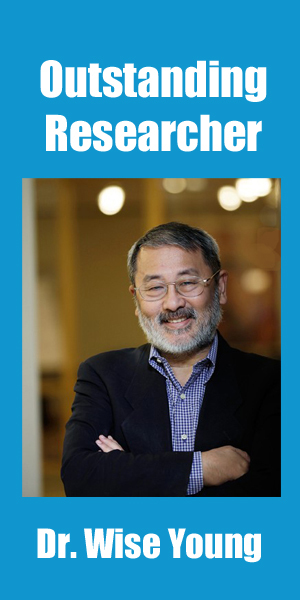 Recognized as one of the world’s outstanding neuroscientists, Dr. Wise Young is truly passionate about finding a cure for spinal cord injury. Every year it is estimated that there are 12,000 spinal cord injuries in the US alone (http://www.ninds.nih.gov/disorders/sci/detail_sci.htm). Currently, there is no cure for a spinal cord injury and the damage is considered permanent. Dr. Young's work challenges this notion. In recent years, Dr. Young has focused his research on using cord blood in combination with lithium and a highly regimented physical therapy program to potentially treat spinal cord injury. As his research has progressed, he has opened a 25-center clinical trial network in China, Taiwan, and Hong Kong, where human clinical trials with umbilical cord blood mononuclear cells and lithium are underway. In the initial results from the phase II trial in Kunming, China, 75% of the participants (15 out of 20) recovered walking with a rolling walker. Currently, he is establishing clinical trial networks in the United States, Norway, and India and will start Phase IIB Trials in 2016 and Phase III trials in 2017. CLICK HERE to learn about other STEM careers in the cord blood industry.